The offseason NHL headlines were generally dominated by the Toronto Maple Leafs when they signed free agent center John Tavares of the New York Islanders. It was understandable as Tavares was the face of the franchise out in New York and was now returning home to a seven-year, $77 million deal. There was another interesting signing though as former NHL star Ilya Kovalchuk was returning to the NHL after five seasons in the KHL back in his Russian homeland. The 35-year-old winger was the first overall draft pick back in 2001 when the now-defunct Atlanta Thrashers took him. He was now making his way back to North America after agreeing to a three-year, $18.75 million contract with the Los Angeles Kings. Kovalchuk’s impressive career began in Russia and he then spent eight years in Atlanta. He was traded to the New Jersey Devils in February, 2010 when the Thrashers realized they’d probably lose him as an unrestricted free agent a few months later. The Devils then signed him to one of the most outrageous deals in NHL history at $102 million over 17 years. The league didn’t approve the contract however and he ended up with a 15-year deal for $100 million. Kovalchuk spent three and a half seasons with the Devils before controversially leaving the NHL for SKA St. Petersburg of the KHL in 2013. At the time of his departure, the 6-foot-3-inch 225 lb left-winger had played in 816 regular-season games with 417 goals and 399 assists under his belt for 816 points while adding 27 points in 32 postseason outings. He was just as good or even better in the KHL where he played 298 games and racked up 327 points on 138 goals and 189 helpers. He also helped his time win two league championships and contributed 43 points in his 63 playoff games. NHL fans were often reminded of him as he played continued to suit up internationally in the Olympic Games and World Championships. He helped Russia win a gold medal at the 2018 Olympics and also captured the tournament’s MVP award. It was obvious Kovalchuk was still a talented offensive player who’s production level hadn’t slipped and he proved this by leading the KHL in scoring last year. In addition, Kovalchuk announced to the media that he wouldn’t mind another stint in the NHL before hanging up his skates. Several teams were interested in acquiring him, but he felt the Kings were the best fit for his skills. Kovalchuk said he felt he could play for a few more seasons at the top level and believed the Kings were a legitimate Stanley Cup contender. He liked the squad’s strong defense led by Drew Doughty and goaltending with Jonathan Quick and thought he’d fit in well alongside center Anze Kopitar. It seemed like a great idea to LA fans since Kopitar had just wrapped up a career year with 35 goals and 92 points. 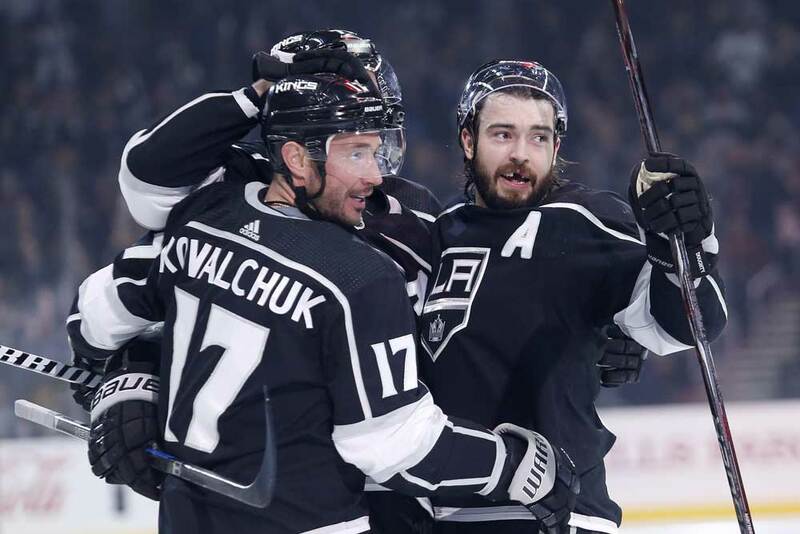 In addition, Doughty cracked the 60-point mark, former captain Dustin Brown notched 61 points and fellow forward Jeff Carter chipped in with 22 points in his 27 games when he was healthy. The fact the Kings have recently won a pair of Stanley Cups also stood out in Kovalchuk’s mind. But things haven’t gone to plan since he arrived in LA. The Kings have been struggling this season and have been in the league basement for most of it. This has resulted in the firing of former head coach John Stevens and Kovalchuk had scored five goals and nine assists in his first 20 games and was a minus-10. Fourteen points in 20 games is nothing to sneeze at, but many fans expected more from a player with his fine passing skills and lethal shot. Let’s remember, Kovalchuk was co-winner of the 2003/04 Rocket Richard Trophy with 41 goals as the league’s top goal scorer. That wasn’t his best showing though as he scored 42, 43 and 52 goals twice between 2005 and 2009 to and scored 98 points in 2005/06 and 91 points in 2008/09. Fans need to realize Kovalchuk’s now in the twilight of his career at the age of 35 and it’s going to take time to get used to the speed of the NHL game again and the smaller ice surface. Even if he doesn’t pick up the pace over the rest of the season he’d finish it with approximately 20 goals and 36 assists for 56 points. However, the chances are pretty good that he’ll get better as the year goes on.